Byron Bay restaurants and cafes are numerous and there really are too many and it's all too changeable to accurately name them all here. We have called Byron Bay home now for 10 years and have seen many Byron Bay restaurants and cafes come and go in that time, the one consistent thing is the quality of food. Being up among some of the best farmland areas in Australia, the produce is always fresh, often organic and the range numerous with tropical, Sub-tropical and semi-temperate foods all thriving. We've put together a selection of our very favourite Byron Bay restaurants - ie - the places we keep going back to, time and again, and the more out of the way places that you might not find on your own. You will be able to discover for yourself as the majority are located in the main part of town and it is all within very easy walking distance. 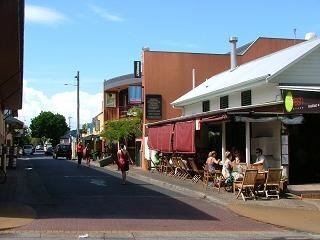 Byron Bay is still a small local village despite it's huge popularity. There are quite a few fish & chip shops but our own personal favourite is the Gourmet Fish and Chip shop located in the alleyway directly behind the beach hotel. On a balmy summers night it has a very mediterranean feel with out-door eating and lively chatter - it's a pity the view across the alleyway isn't a bit more interesting than the back of the beach hotel and it's car park entrance - but it's not too bad and you can't have everything. The alleyway has a certain charm and there are plenty 'more upmarket' places if you want more glamour. There are a number of places in and around town to wet your whistle but only 3 hotels - or pubs - as we call them back in Ireland. 3 hotels for such a small town in Australia is good - although my local town back in Ireland has 35 pubs - but that's Ireland for you..
Byron Bay hotels are all needed during the busy times of the year - the rest of the year they can be a bit quiet especially during the week - but you don't come to Byron Bay for the night-life - although some of the backpackers might disagree with that - so what do we know - our backpacking days are behind us - probably..